Serves: 2 Prep Time: 1 hr. 30 min. Cook Time: 5 min. Cube a half of a pie pumpkin and sautee in butter until soft. Let cool, then drop the pumpkin into the Roma by Weston Sauce Maker & Food Strainer (you may drain the butter or include it in the filling). Simmer with heavy whipping cream for 20 minutes, stirring occasionally. Set aside to cool. Sift together Semolina, cinnamon, nutmeg, ginger, and salt. Crack eggs and pour wine into center of dry mixture. Turn mixture into center until mixed thoroughly. This dough should be somewhat drier than regular pasta dough. Knead for five minutes and let rest for 20 minutes. Finish kneading by rolling through the Roma by Weston 6" Pasta Machine at setting seven, folding over a few times. Finish rolling the pasta sheets by feeding them into the machine, lowering the setting each time until setting setting two. Remember to constantly flour the dough. Trim the sheets with the wheel cutter (comes with the ravioli attachment). Attach the Ravioli Cutter Attachment to the machine and insert the handle. Divide the sheets with a horizontal line into two equal sized sheets. Place the two sheets onto the wooden rollers of the attachment. Start cranking the handle, making sure the dough is being fed into the machine. Drop the pumpkin filling in between the two sheets. Turn the handle to seal this row, and then repeat. When the ravioli sheets are complete, allow them to dry for 10 minutes before tearing them apart. Cook ravioli in boiling water for 4-6 minutes. Rather than cooking them, you may also freeze the ravioli at this point to save them for later. Add a little olive oil or vegetable oil to keep them from sticking together if you choose to freeze them. 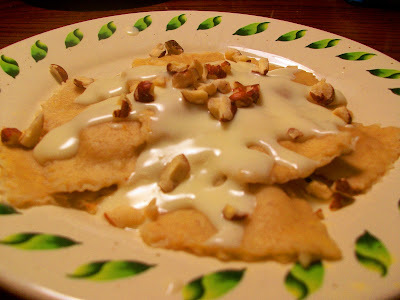 Simmer Frangelico and heavy whipping cream for 20 minutes, then drizzle over ravioli. Garnish with crushed hazelnuts. Is this a desert and NOT a main course?? See Weston On Food Network!